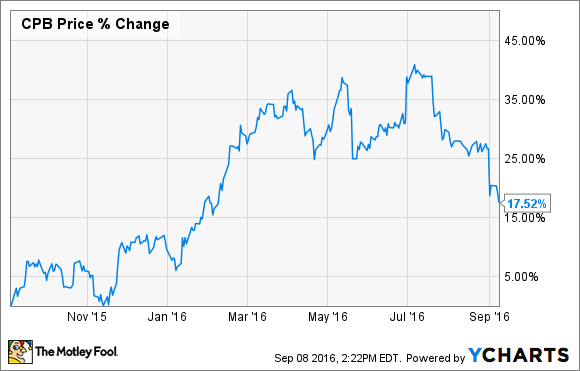 What's Cooking With Campbell Soup Company? Campbell works to recover from a couple of notable issues that held back sales. Campbell Soup Company (NYSE:CPB) released fiscal year 2016 earnings on Sept. 1 and the stock dropped roughly 6% over the next four market days. While shares have weakened as of late, they are still up about 17% over this same time last year, on overall improving profitability. What were the highlights from the latest report, and what is the company's outlook for the year to come? Could shares resume their run higher? Let's take a look. Campbell finished the year in line with guidance and with strong profit growth. "However, our results this quarter certainly did not meet my expectations," said CEO Denise Morrison during the conference call with analysts. Revenue came in at $7.96 billion, a 1% decrease from the previous year. Profits as measured by adjusted earnings per share increased 11% to $2.94. During the fourth quarter, revenue was unchanged and profit dropped 6% compared with the previous year's fourth quarter. "I am particularly unhappy with the short-term executional issues that have led to the poor performance in Campbell Fresh, both for the quarter and for the year," said Morrison, referring to a division in its first year of operation. While only 13% of total revenue in FY 2016 came from the new segment, which includes Bolthouse Farms, Garden Fresh Gourmet, and Campbell's refrigerated soups, the hope was that the overall business would benefit from the growing healthy-eating trend in the United States. The segment didn't push overall business growth, as indicated by the 1% year-over-year drop in revenue. In fact, sales from the new group of healthier-eating businesses declined 5% in the fourth quarter, or 12% excluding the impact of the acquisition of Garden Fresh Gourmet. The reason? The company cited not the strategy of moving into healthier and organic foods, but the execution, calling out a recall of Bolthouse Farms Protein PLUS and "poor performance" in the carrot business. What went wrong and is it fixed? During the last quarter of the year, Campbell voluntarily recalled 3.8 million bottles of Bolthouse Farms' Protein PLUS beverage due to possible spoilage and set about fixing manufacturing equipment and processes. Production has been disrupted as a result and is expected to be impacted through the end of 2016. The poor performance of the carrot business was also given as a reason for the poor finish to the fiscal year. Weather-related issues during the summer were compounded by planting and harvesting decisions made earlier in the year. "This led our farm's operation to harvest carrots prematurely in an attempt to meet customer demand. Ultimately, this resulted in a spring crop that yielded smaller carrots, which led to customer dissatisfaction and an additional loss of business," Morrison said. The disruption led to losses in revenue in the Campbell Fresh division. To address the issues, the company instituted management and organizational changes, including the creation of three distinct businesses operating under the Campbell Fresh umbrella, up from the previous two units. The expectation is that the changes will have all issues ironed out by the first few months of 2017. "Our plans call for C-Fresh sales to be down slightly in the first half and return to growth consistent with its portfolio role in the second half. Putting it all together, we expect sales growth to be in the low-single digits for fiscal '17," Morrison said. Throughout the company in FY '16, while overall sales failed to gain any traction, profits increased thanks to increased supply chain efficiency and cost savings. While the company hopes to drive modest overall growth with its fresh and healthy eating options, the real focus for the coming year will continue to be efficiency. Getting more out of existing and established brands will be key, including more cost savings by making food supply and delivery faster and cheaper. Also on the agenda is getting the beverage and carrot businesses that operate under the Campbell Fresh division back up to speed. The company will be spending at least a couple of more quarters recouping from the setbacks seen earlier this summer. Increased marketing spend is expected, but without sacrificing gains in profitability. As a result, headwinds to growth are expected to crop up in the 12 months ahead. Campbell is looking for total sales to be flat to up 1%. An increase in profit as measured by adjusted earnings per share is anticipated in the range of 2% to 5%. Any increase will be driven by the company's efficiency and cost-cutting campaign. Campbell Soup Company has had a great run this year, despite the recent sputter over the summer. However, as the company enters a new fiscal year, it looks as if that sputter could persist, as the high hopes for the Campbell Fresh division has some kinks that need to be worked out. Don't be surprised to see shares of the company take a breather as these issues are addressed. 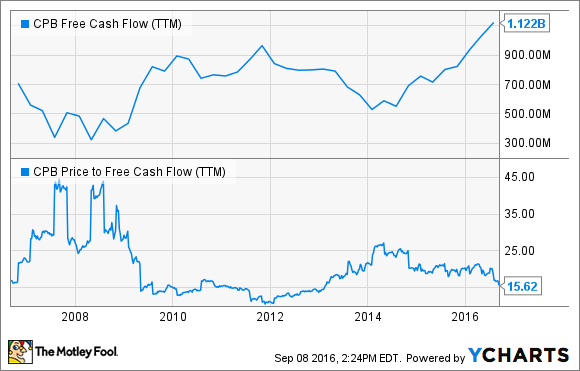 Free cash flow generation, or cash left over after operations and expansion efforts are paid for, is on the rise. Price to free cash flow, a measure of the company's valuation to the extra cash generated, is on the decline as a result and would indicate that the stock might be a good value. As Campbell Soup works out operational issues and gets the business back on track, I would view any pullback in price as an opportunity to buy more shares for existing owners of the company. This would especially be the case if the company has continued success in increasing profits while simultaneously building out a platform of sales growth for the future through its ready-to-eat fresh-foods division.